Insulating layer made ​​of high quality synthetic material is used to ensure high quality, reliability and durability of HOLA ™ ignition leads from Prime Technology series. Ignition leads from Intense Technology series are produced with two insulating layers of silicone rubber and carbon conductive core. Contact connectors of copper alloy do not oxidize and provide reliable joint of ignition system parts. Sealing of joints is made with thermoplastic caps with high insulating properties. Ignition lead diameter is 7 mm. 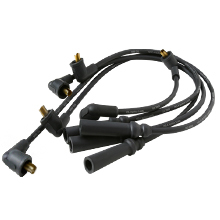 Technology for HOLA ™ ignition leads manufacturing provides for using of advanced materials. High quality is ensured by production automation and effective organization of quality control. Manufacturing is organized in full accordance with ISO9001 requirements. Better dynamic performance and efficiency of vehicle. Reduced engine pollutant emissions. No electromagnetic interference during engine running. Estimated operating life of ignition leads is more than 36 months or 50 000 km run*.